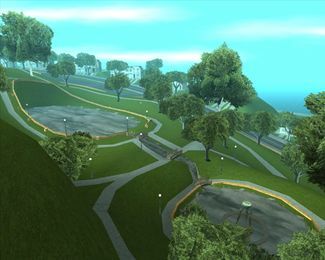 Palisades is a district of San Fierro, San Andreas. It is an extremely affluent neighborhood situated on the western shore of the city. To the east is Juniper Hill; to the north is Paradiso; to the south is Santa Flora. Palisades is influenced by San Francisco's Presidio Heights, the site of some of the city's finest homes and richest residents, second in affluence only to neighboring Pacific Heights. Similarly, the residents of this district are very wealthy and somewhat pretentious. Expensive cars and limousines can frequently be seen driving its streets, and pedestrians are often very well dressed. The one eyesore in this lush, rolling area is the Tuff Nut Donuts building at the very southeast corner of the neighborhood, with a garishly large plaster doughnut perched on its roof. This page was last modified on 28 January 2013, at 21:18.